1990 Melissa & Laurence Begin Making Woodcarvings Together! After falling in love in 1969 and being apart for 20 years we found each other again and began making woodcarvings under the name MELISSA * LAURENCE ARTISANS. Traveling to exotic places and showing our sculpture on the art circuit across the USA. 1992 Melissa * Laurence Carousel Horse Survives Hurricane! When hurricane Andrew hit Betsy and Jeff Cohen's house in Miami, FL, it destroyed their home and everything in it. Only one thing was left standing.......their Stein & Goldstein reproduction by Melissa * Laurence. While exhibiting in the Coconut Grove Arts Festival February 1994 Betsy invited us to visit their new home in Coral Gables to reguild the gold on this horse which had been damaged by the saltwater. We were astounded when she showed us the photos of our sculpture standing virtually unharmed in all the destruction. Truly amazing! 1995 Melissa & Laurence Wed! On January 1, 1995 Melissa & Laurence had a Buddhist Ceramony in the Thai tradition and honeymooned for a month in Thailand and India riding on elephants and camels and visiting temples. We were on the trails of Richard Gere from temple to temple. He's a buddhist, too. www.buddhabucha.com. 1996 Melissa Is Asked To Make An Ornament For The White House! In August 1996 Melissa had surgery and was unable to work on heavy woodcarvings. When the Whitehouse requested I do an ornament for the Blue Room Christmas Tree I was so happy I had something I could work on for the next month while I recovered. Mrs. Clinton had chosen the Nutcracker's Suite as the theme so it seemed fitting for me to carve a rocking horse ornament. I later received an invitation to visit the Whitehouse during the holidays and was given a private tour by an aid to President Clinton. What a thrill it was to see my ornament on the tree! It remains in the permanent White House Collection. Click here for a link to the White House Holiday artists. When HGTV called to feature our sculptures on the episode "Our Place" we knew immediately that the home of our Elite Club members Jack and Jane Mandula would be the ideal place to film. Their beautiful Alpharetta home is decorated throughout with six MELISSA * LAURENCE carousel and rocking animals. 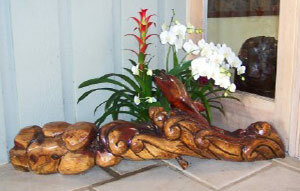 Check out our link to HGTV to get ideas on how you can decorate with our sculpture! 2002 Family Tree Planted From A Seed Becomes A Melissa * Laurence Sculpture! Customer Josh Rutter of our Elite Club had already commissioned us to create five woodcarvings for his family. When he called to ask us to design a sculpture out of the mahogany tree trunk his father had planted from seed when he was a boy, we were a bit hesitant. When we saw the beautiful wood we couldn't resist. We designed a sculpture of the waves beating against the rocks with a dolphin jumping out of one of the waves, so he would have a rememberence of his time spent with his family by the shore. 2003 New Website Created For Melissa * Laurence! When our website began, boy were we surprised when the first order to come in was to make a rocking colt for Sarah Jessica Parker and Matthew Broderick when their son James Wilke was born in Oct.2003. 2003 Atlanta Magazine Picks Melissa * Laurence Artisans Best Instant Heirloom In Best Of Atlanta December Edition! Many of our customers have already had our rocking animals long enough to see them passed down in the family. Just look at our club members with 3 or more rocking animals! 2004 Aslan The Great Lion! 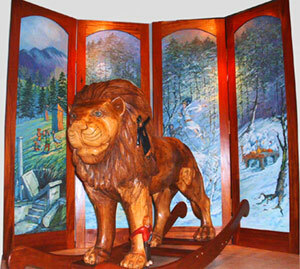 When customer Marty Ducette saw our rocking lion at the Ann Arbor Street Fair in August 2003 he couldn't stop thinking about the stories he used to read to his four children from the "Chronicles of Narnia". He later called us to create "Aslan the Great Lion" and asked if we could depict his children riding on Aslan. Well our beautiful strong rocking lion with bright blue eyes carried Marty's four children all the way to our Louisville, Ky show in October of 2004 where he picked up Aslan and carried him the rest of his journey to Indiana, to be presented to his wife on Christmas day. There wasn't a dry eye in the house! 2005 Melissa * Laurence Rocking Colt On Oprah! Did you see Sarah Jessica Parker on Oprah Wednesday October 5, 2005? They showed a photo of son James Wilke, now age 3 on his MELISSA * LAURENCE rocking colt, enlarged on the backdrop! If anyone has a tape of it please let us know! We are excited about our last 3 shows for 2005. We hope to see many of you in St. Petersburg, FL, Charlotte, NC, or Sarasota, FL. This will be bittersweet for us as we begin our sabbatical in January we will miss those of you we usually see in South FLA. But, we look forward to a spiritual journey through Asia, a time of learning and a time of reflecting. Please be aware that we will not be available to place orders during this time. SO PLEASE GET YOUR ORDERS IN EARLY FOR THE HOLIDAYS!